A young girl named Alice (Kathryn Beaumont) follows a white rabbit (Bill Thompsom) down a hole into the fantastical world of Wonderland, where nonsense is the norm. Disney's 1951 animated film "Alice in Wonderland" is an adaptation of the Lewis Carroll novel "The Adventures of Alice in Wonderland." It also has some elements of the followup book "Through the Looking Glass." Like most of Disney's animated features of this era, it is a vastly truncated version of the story with a rather short run time for easy consumption by younger audiences. The story here is extremely simple. It is about a curious little girl named Alice, voiced by Kathryn Beaumont, who becomes enamored with a white rabbit wearing a waistcoat and carrying a watch. The rabbit, voiced by Bill Thompson, is constantly exclaiming how late he is, and Alice cannot understand what a rabbit could possibly be late for. She becomes obsessed with finding the answer to her question, which leads her down a rabbit hole into Wonderland. Once there, she continues her pursuit of the White Rabbit, but runs into many different characters along the way. These other characters consist of Tweedle Dee and Tweedle Dum, both voiced by J. Pat O'Malley, The March Hare, voiced by Jerry Colonna, The Mad Hatter, voiced by Ed Wynn, The Cheshire Cat, voiced by Sterling Holloway, The hookah smoking Caterpillar, voiced by Richard Haydn, and of course, the ill-tempered Queen of Hearts, voiced by Verna Felton, who has a deep love of decapitating people. When Alice lived her everyday life, she would dream of a nonsense world like Wonderland, full of creatures and potions and all sorts of new things. Once she found herself in such a place, however, now, all she wants to do is find her way back home, which is a pretty common tale in fantasy adventure films like this. As with most old school Disney affair, there are some great memorable songs in the movie, as well as some quotable dialogue to boot. The animation is extremely imaginative and very colorful. The world of Wonderland is a whimsical, magical place, and this really adds to our enjoyment of the overall experience. The surrealism of Wonderland might be visually compelling, but unfortunately, this film is not perfect. It might have some great voice over work, but it essentially consists of Alice meeting numerous characters over and over again until the entire thing comes to an end. It's just too basic to hold up in a world that now features the likes of "Zootopia" and "Up." 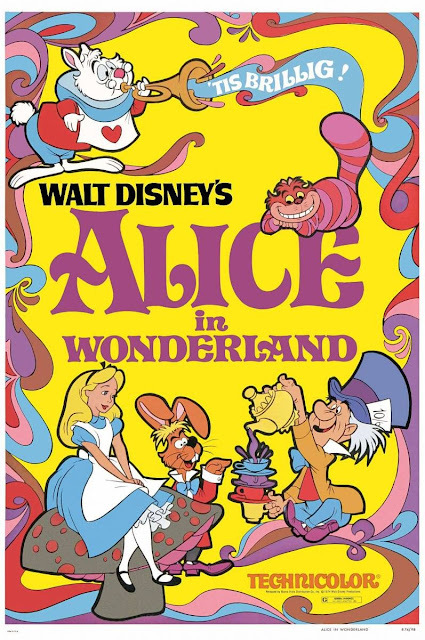 "Alice in Wonderland" might not be our favorite film from Disney, but it is still very good and is certainly much better than its modern day counterpart.